It has recently been reported that West Yorkshire Fire Service has made almost £450,000 since 2014 from charging businesses who persistently call them out on false alarms. They’re charging companies £375 a time where they’ve had them out more than 3 times in a 12 month period. The initial design of the system is vitally important. No two system set ups are exactly alike as yours will be designed for your specific environment. One of the most common causes of false alarms is improper placement and use of detectors such as placing smoke detectors in a steamy or dusty environment or not using weather appropriate detectors outdoors. It goes without saying that the quality of the equipment itself needs to be high. Hand in hand with proper design of the system is expert installation. However well the system is designed, you could experience issues if the installation isn’t fit for purpose. A good engineer will work with the design of the system and resolve any issues that may transpire at the time of installation. Continued maintenance after the point of installation will not only keep your alarm in good working order, it is a legal requirement. Depending on the type of alarm and premises, it will require servicing at least every 6 months. This will ensure that the battery has sufficient charge and that any wear and tear is dealt with. It will also enable the engineer to deal with any environmental changes such as change in use of a room that leads to an increase in steam, dust or heat and perhaps any structural changes to a building (we once had an example where a client had installed suspended ceilings and covered most of the detectors!). We can also make sure that detectors are clean and free from dust or grime which would compromise their functionality. 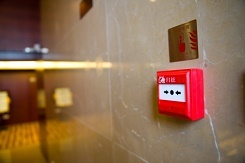 Obviously, the main motivation for keeping your fire alarm working well is to provide an early warning system to keep people safe and minimise damage to the building but avoiding a potential fine from the fire service is no bad thing either. Did you know we can take over alarm servicing, even if we didn’t install the alarm? If you’re not happy with your existing provider or just wonder whether you could be getting better value elsewhere then please give us a call on 0345 833 5543 or send us a message.